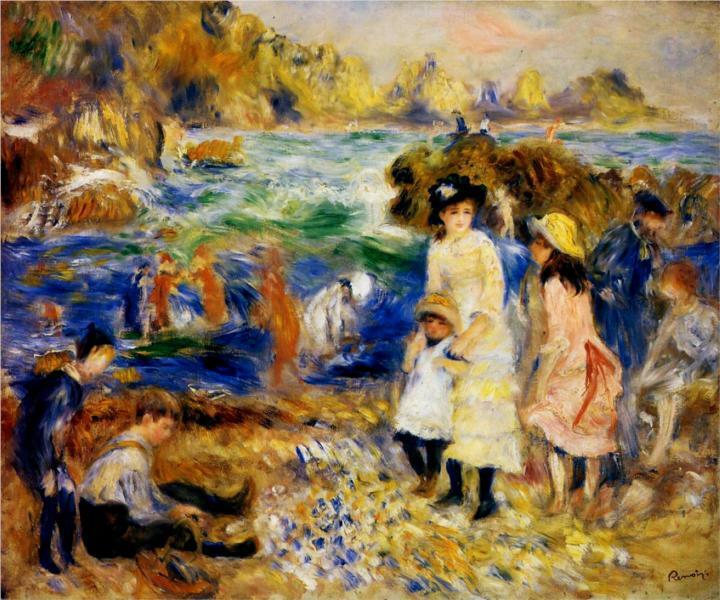 The French Impressionist painter Pierre-Auguste Renoir spent a little over a month on Guernsey in the late summer of 1883, staying in lodgings at No 4 George Road, St. Peter Port. He painted about fifteen pictures on the island, none of them large, and all showing views of the bay and beach of Moulin Huet, at the east end of the island’s rocky south coast and within easy walking distance of his lodgings. 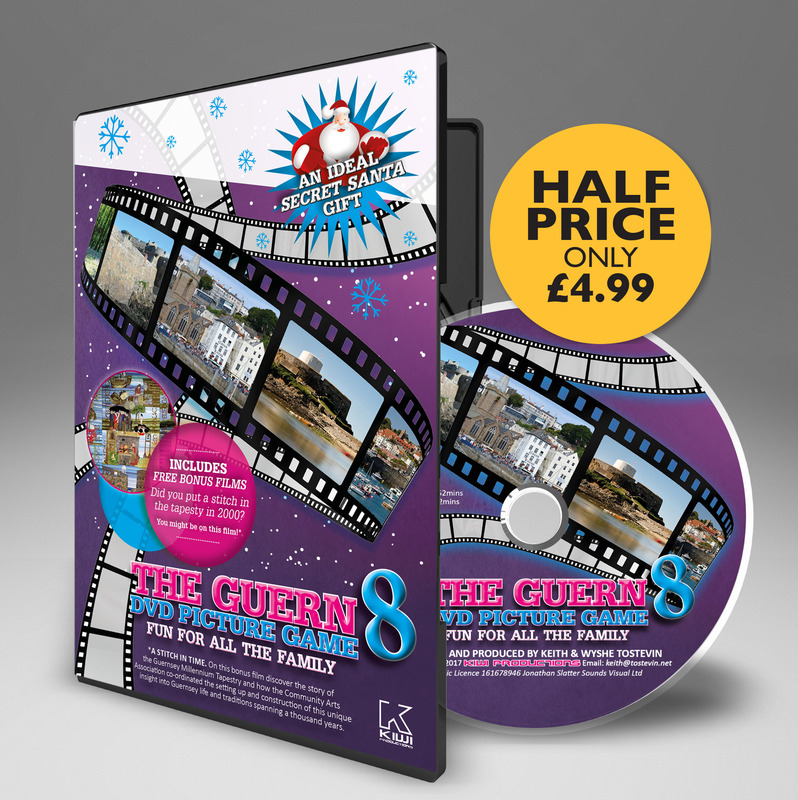 We do not know why he came to Guernsey. A group of friends accompanied him, among them Paul L’hote and perhaps his wife-to-be Aline Charigot. 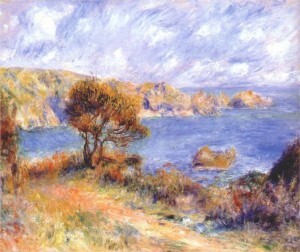 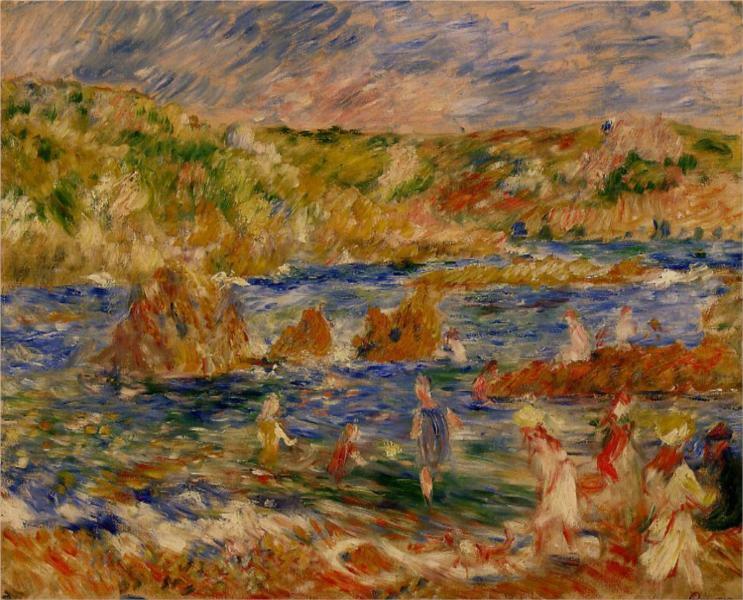 We have no indication, however, of their reasons for choosing Guernsey rather than the coast of Normandy, which Renoir had visited and painted several times in the previous five years. 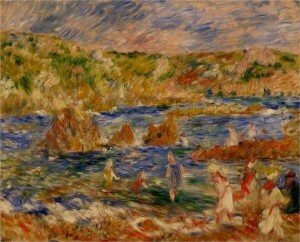 The paintings are varied in theme; panoramic views from the track leading down to the bay, scenes with groups of figures among the rocks on the beach, and simpler sketches of rocks and sea. 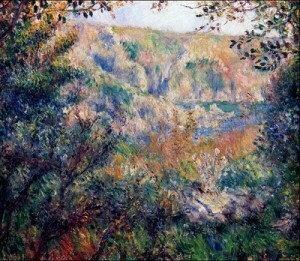 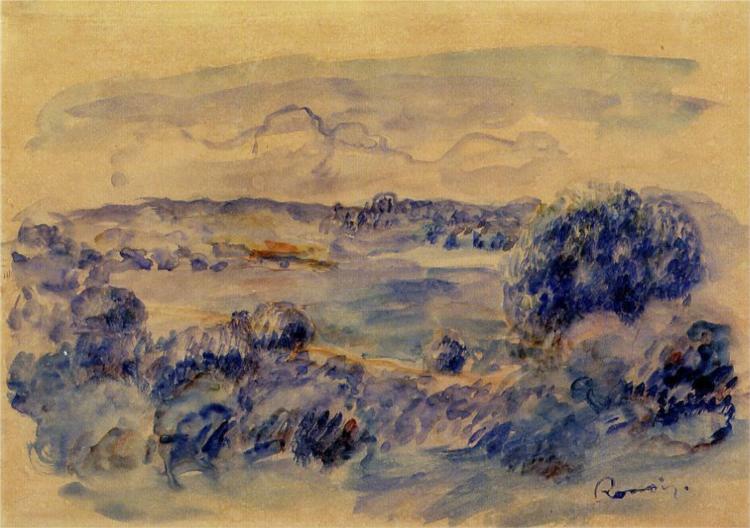 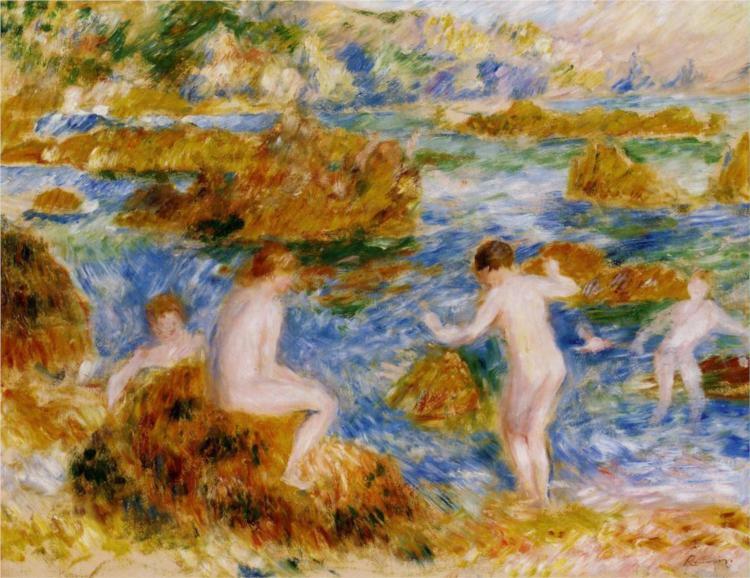 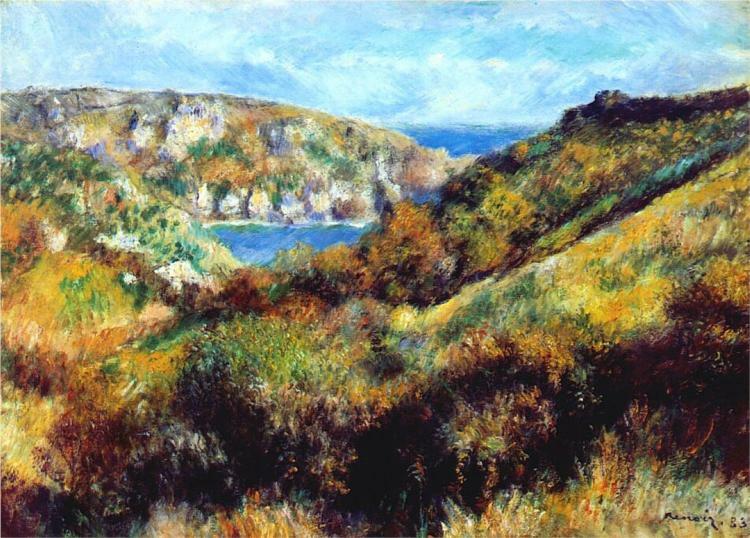 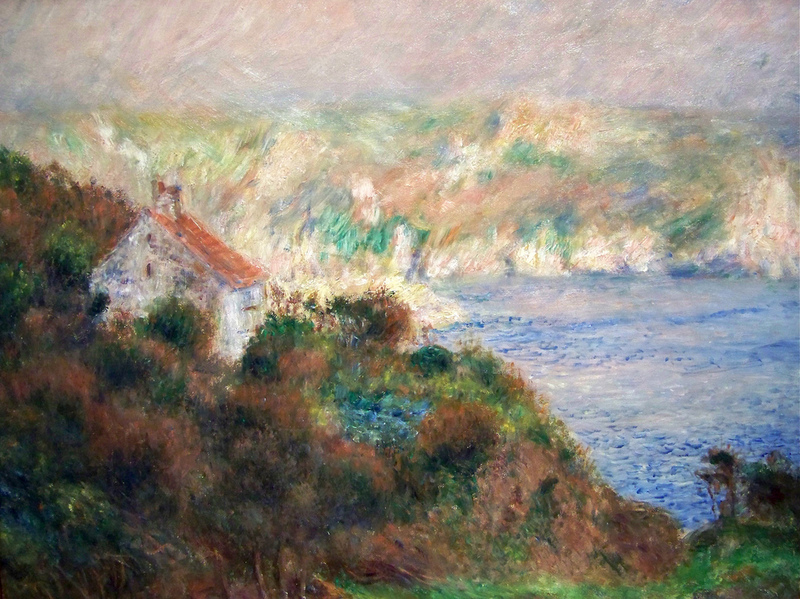 Nothing of the island’s agricultural or commercial life puts in an appearance in Renoir’s paintings. Greenhouses, of course, were hardly a promising motif for a landscapist; but earlier in his career Renoir had often painted towns and villages in France, and in 1880 he had exhibited at the Paris Salon a large canvas of mussel gatherers on the Normandy coast. 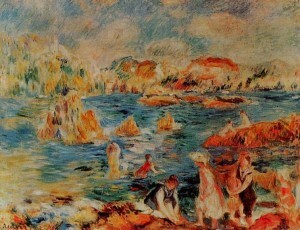 Yet neither the autumn seaweed harvest with its attendant festivities, which took place during his stay, nor the picturesque streets and harbour of St Peter Port, attracted his brush. 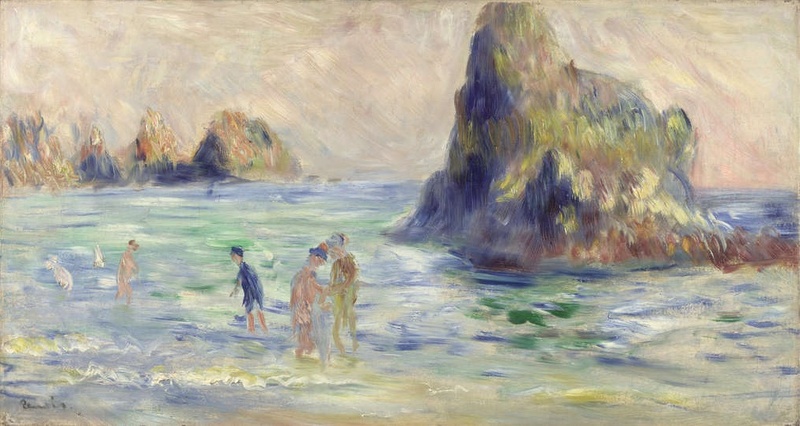 Only tourism, in the guise of some of the figures in his beach scenes, puts in a discreet appearance; otherwise, his pictures present the island as a refuge, a place of escape from the modern world. 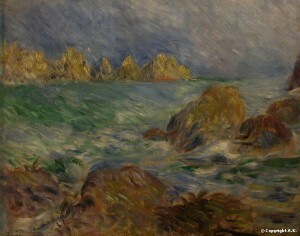 These paintings were the subject of a set of commemorative postage stamps, issued by the Bailiwick of Guernsey in 1983.